I’ve been waiting for the most depressing day of the year to be announced (one of my little hobbies..) and apparently it’s today. Today, Monday the 18th January. 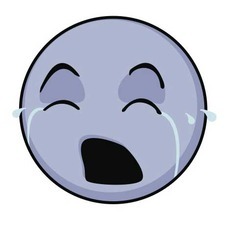 ‘Blue Monday’ is always in January and usually the middle of January – when the glow from Christmas has faded off. A cheery psychologist called Cliff Arnall has worked out six factors to calculate the day of the year on which people are most likely to be depressed: the weather conditions, debt level (the difference between debt accumulated and our ability to repay the debt), the time since Christmas, the time since failing to keep our New Year’s Resolutions, low motivation levels and the pressure to take action. Enough already. It’s enough to make me close my head in my laptop in a vain attempt to find warmth and comfort in this cold world. Anyway, where there’s a human emotion, there’s a gadget making company with a gadget to cater to it: and that is what the Lightbox is. It is essentially a light, but one which is supposed to improve your mood in the winter, particularly if you are affected by Seasonal Affective Disorder (or SAD). Lightboxes ain’t cheap costing between £75 and 265, though they come in a range of different sizes and intensities. My favourite is at the more affordable end – the DawnLite Natural Alarm Clock which wakes you up with light instead of an alarm. Personally I might be disappointed to discover that it is not in fact a summer dawn but actually a Tuesday, in January, but then that’s probably a product of my bitter glass half-empty frame of mind. Gotta sort that out sometime. To sufferers of SAD, there appear to be genuine benefits to time spent in Light Therapy. 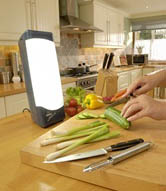 “Up to 85% of sufferers of Seasonal Affective Disorder see their symptoms improve when they use light therapy”. See the site here for more information.